Brian Stuparyk of Steam Whistle Letterpress and Design is the subject of this OTRview. Stuparyk has mastered the art of letterpress printing and opened up shop at 1342 Main Street in Over-the-Rhine. His shop is showcase for a form of printing that is as much about art as it is about ink. The products he creates range from wallet-sized business cards to poster-sized broadsides. Because of the way the hand-powered press interacts with the ink and paper, Steam Whistle’s prints are both a visual and a tactile experience. I think Steam Whistle’s broadsides are exceptional and would look excellent in the windows of storefronts and restaurants. 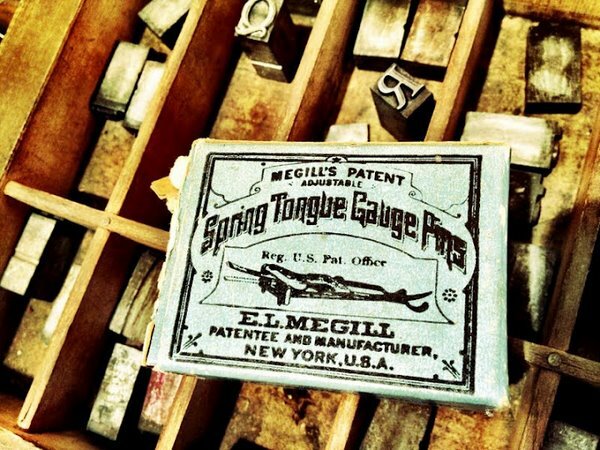 Stuparyk’s journey to OTR is a storied one that has taken him far and wide in search of rogue vintage printing remnants. Read more about Steam Whistle in this Enquirer article from last month and on its website: steamwhistlepress.com. I really do appreciate Over-The-Rhine, though I’m not sure that it was love at first sight. I had gone to high school here in Cincinnati and left to study photography in Toronto. During the summers I would come back here to the suburb where we lived and it was deadly boring! I decided one day to walk from UC to the river and back (with my camera on my hip). I remember thinking how beautiful OTR it was, but also how abandoned. I guess I found it equal parts beautiful and ugly. I didn’t take any pictures though. This was the summer of 2001. That was a decade ago and my perception has changed, and the neighbourhood has also changed.. I have felt very welcome since I opened my doors a few weeks ago. 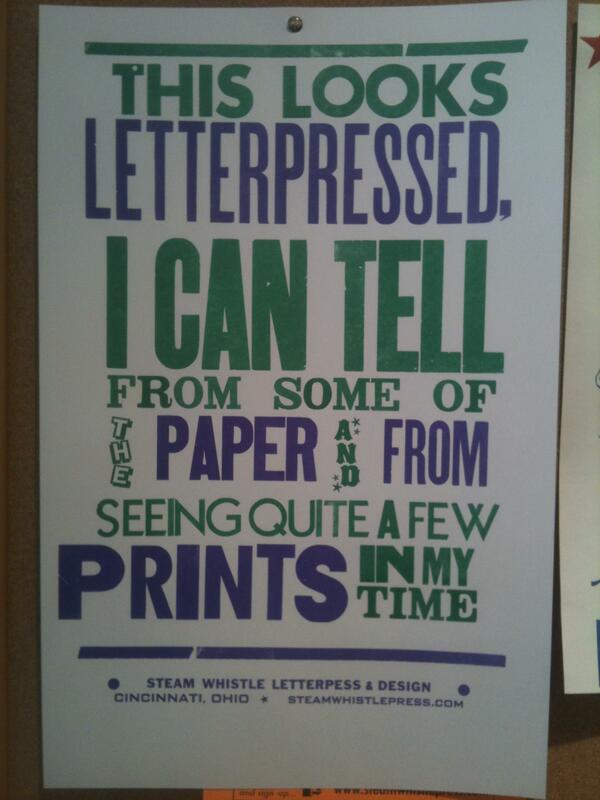 Could you tell readers a little bit about yourself and how Steam Whistle Letterpress and Design came into being? I bought a letterpress 12 years ago while I was living in Toronto. I was studying darkroom photography (this was before the digital age) and as the process began to take place more and more on computers, I became less and less interested in it. I began investigating how images were reproduced before computers and became fascinated. Since then I’ve spent a lot of time learning about letterpress and printmaking and after getting my MFA in 2007, I started teaching. Up until 3 months ago I was teaching printmaking full-time at NKU. Then in November, I decided to take the leap and go into business for myself. 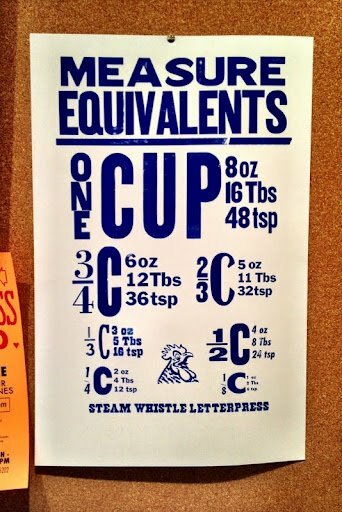 Steam Whistle’s website says, “With carefully-restored vintage presses and over 100 cases of wood and lead type, we’re a contemporary printshop steeped in historic tradition.” When did you start collecting type and where do you find so much of it? I’ve been collecting this stuff for years, following leads, word-of-mouth, cold calls etc., and generally chasing it all over the midwest. Some of it came from as far away as Canada. Other cases I bought just a few minutes north of here. You just never know. I actually have closer to 200 hundred cases. I like to stay away from sites like eBay where the prices get inflated, but sometimes it’s the only way to find a particular item. And this stuff is dirty and it’s heavy! It’s not so simple to buy a press and start making prints. There are hundreds of thousands of little tiny bits involved with traditional letterpress printmaking. Each particular bit lives in a particular compartment, in a particular drawer. 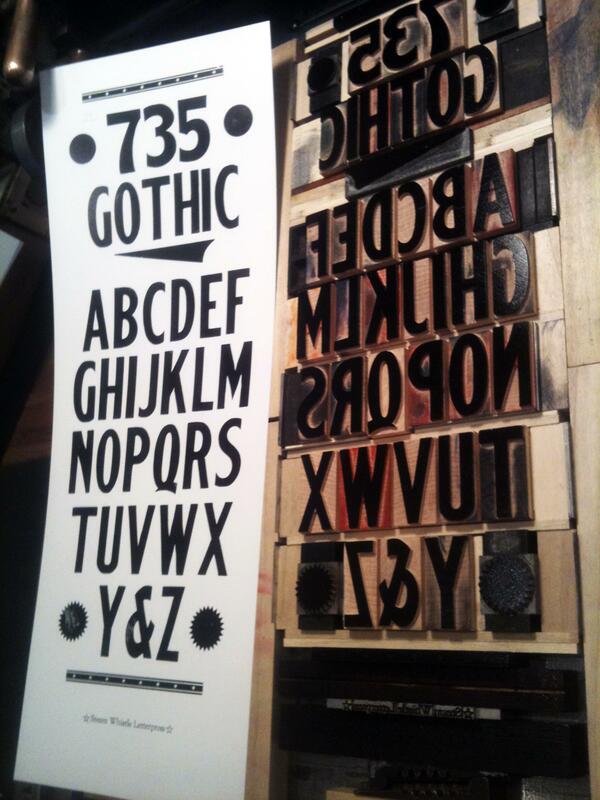 Also, I had some of my wooden type made new for me, from the original AWT (American Wood Type Mfg. Co) patterns by a gentleman in upstate NY, he cuts type by hand on a pantograph. 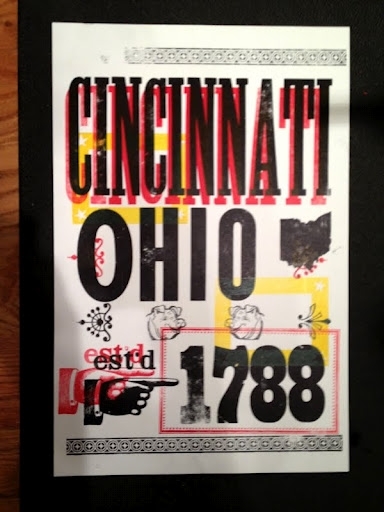 Why did you decide to open Steam Whistle Letterpress and Design in OTR? Since moving back to the area a few years ago, I watched all the creative- types (designers, printmakers, gallery owners etc. )come down here and set up shop. The store fronts and facades are old and beautiful and its really exciting what’s happening down here, especially along Main Street. I decided that I wanted to be a part of this and to actively contribute to the dialogue and restoration. I looked at a few other places, in Newport and Covington etc, but I wanted to be in OTR. There’s an excitement about the OTR neighbourhood right now. The Emery, the streetcar, ( dare I say), the casino. Things are happening both big and small. What services will you offer? What are your workshops and how does someone register for one? 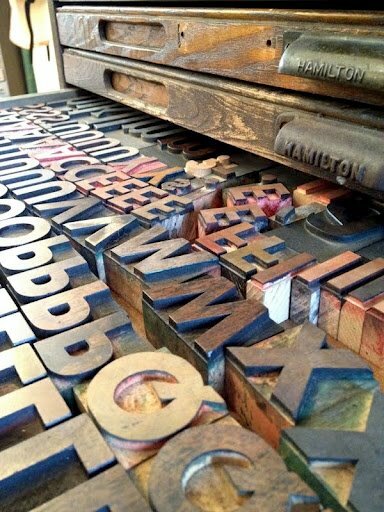 The services we offer short-run, full custom letterpress and design. That includes custom designed invitations and cards, stationery, posters and anything else that needs to be unique and beautifully printed on fine paper in under 500 copies. 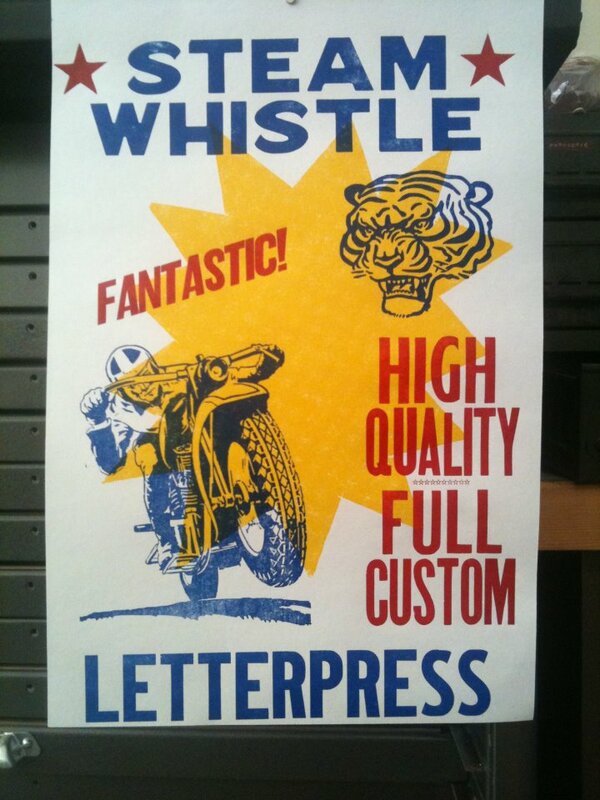 We can turn any piece of art into a letterpress print, big or small. We are also working on developing new services such as foil stamping, something that is poplular with Kindle users who want their leather covers to resemble fine volumes! The workshops we offer are 5 hours each on either Saturday or Sunday and cover a variety of topics including posters, business cards and greeting cards. Participants get a good introduction to typesetting, press operation and printing history. The cost of the workshop includes all necessary materials and all experience levels are welcome! Everyone interested in taking a workshop should check out our website for information and to register: www.steamwhistlepress.com. My landlord, Ron Schweitzer is very supportive of the direction that OTR is going and as a result has been very helpful to me as we secured and set up Steam Whistle Letterpress. The building is a turquoise Italianate number. It used to house the DesignSmith gallery, which I believe was a furniture showroom. It’s a beautiful space with high ceilings, big windows and some very beautiful but unfortunately-painted-orange french doors. Someday I’ll re-paint them. 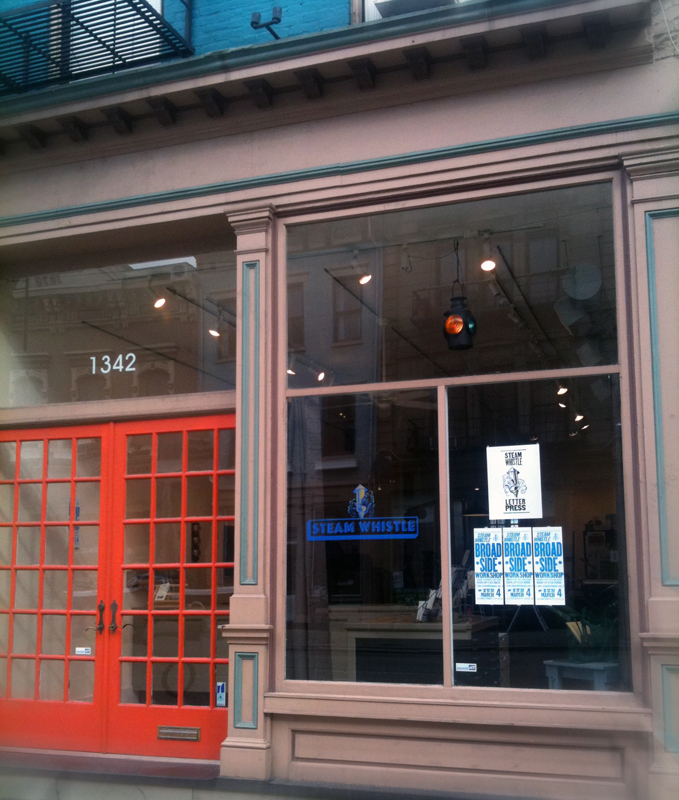 We are across the street from the Iris Book Cafe and one storefront down from Shadeau breads. At 8:30 every night the shop starts to smell like fresh bread. It’s right in the middle of everything! You opened during January, 2012’s Final Friday gallery walk. How has the neighborhood greeted you and your business? The neighbourhood has been great! I really like everyone I’ve had the chance to meet along Main and Vine Streets. There is so much going on down here during Final Friday, and a lot of people come out to our opening thanks in large part to a fantastic article in the business section of the Cincinnati Enquirer. We’ll be open every Final Friday with something going on, whether it’s printing posters, hosting another open house sometime, or just giving away coffee and talking shop! I invite everyone to stop in and say hi! What would you say to someone interested in opening a business in OTR? There are a lot of great reasons to open your business in OTR, for instance the rent is downright reasonable and there are some really great restaurants nearby. It’s a neighbourhood on the up and it’s a great feeling to be a part of that! But I’ll caution everyone by saying this: everything about starting a small business is big and complicated. I was able to get this off the ground with a lot of help from those around me, my father in particular has given a lot of his time. It’s a lot of work and a lot of hours, but I’m doing it for myself and that makes all the difference.